Fundamentals of Laboratory Automation. 2. Computers in the Laboratory. 3. Automation of Sampling. 4. Automation in Sample Treatment. 5. Automatic Continuous Analysers. I. Air-Segmented Flow Analysers. 6. Automatic Continuous Analysers. II. Flow-Injection Analysis. 7. Automatic Continuous Analysers. III. Other Automatic Unsegmented Flow Methods. 8. Automatic Batch Analysers. 9. Robots in the Laboratory. 10. Automation of Analytical Instrumentation. I. Spectrometric Techniques. 11. Automation of Analytical Instrumentation. II. Electroanalytical Techniques. 12. Automation of Analytical Instrumentation. III. Chromatographic Techniques. 13. Automatic Titrators. 14. Automation in Clinical Chemistry. 15. Automation in Environmental Pollution Monitoring. 16. Process Analysers. Index. This new monograph provides a comprehensive overview of the state of the art of the automation of laboratory processes in analytical chemistry. The topics have been chosen according to such criteria as the degree of consolidation, scope of application and most promising trends. The first part of the book begins with the basic principles behind the automation of laboratory processes, then describes automatic systems for sampling and sample treatment. In the second part the principal types of analysers are discussed: continuous, batch and robotic. 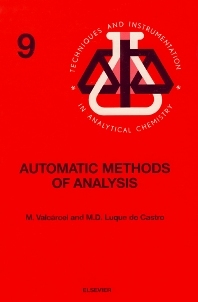 The third part is devoted to the automation of analytical instrumentation: spectroscopic, electroanalytical and chromatographic techniques and titrators. The last part presents some examples of the application of automation to clinical chemistry, environmental pollution monitoring and industrial process control. The text is supplemented by 290 figures and 800 literature references. It is written primarily for scientists directly involved in laboratory work and those responsible for industrial planning and control, research centres, etc. It will also be of interest to analytical chemists wishing to update their knowledge in this area, and will be of especial interest to scientists directly related to environmental sciences or clinical chemistry.